M - 4, Ground & First Level, Office No - 124 (Campus-2)South Extension Part-II, New Delhi - 110049, India. A life well lived needs to be elevated to an exquisite livingstyle. Where your passions flow and immerse in the playground of life. Each action enhanced to a 360o vision. Of a life of living luxury with every amenity & facility conceivable at hand. Yet tightly embraced in greens. A a placid certitude of sustainable living ensuring peace of mind-always! Your search leads to Greater Noida villas. Where connectivity reaches out to bring the Capital and NCR closer. Greens bloom and Pollution stays away. A planned sub city of ample spaces that allows a life you choose. And then settle yourself in a luxury villa in Greater NOIDA. Nestling here, at THE HEMISPHERE, choose a life embedded in haute living even as you ensconce yourself in the greens. Amongst all the villas in Greater NOIDA, it’s centrally located and well connected to offices, children’s education, dining, partying holes & entertainment hubs of Delhi-NCR by the Metro, Road and Air. The 100 acres golf residence villas project property offers a 9-hole golf course in its span. Amidst expanses of greenery. And an embedded green construction that allows you to revel & celebrate a sustainable life. All that you can think of in terms of facilities are at a short distance in these golf residence villas. And also something you wish – crème de la crème community – wedded to a golfing high-living! Start your day with refreshing morning breeze as you purview the golf course. Take off with the irons for the game beautiful as you chase that perfect score. Enjoy a lazy afternoon with the family as you find all facilities at hand. Entertain your friends at home as they marvel at your views – or travel together to the center of you life's passion and challenge each other to that perfect score. Or leisurely enjoy a superbly elegant meal at the Clubhouse. 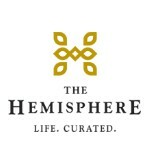 The Hemisphere invites you to some of the most elegant and luxurious homes with the incredibly renowned architect blending haute styles with modern sensibilities. You can indulge in outdoor activities and a game of golf or choose to luxuriate and party within the most fabulous dream home.